"Seven seconds after takeoff a row ensued in the cockpit: The captain started arguing with his crew as to which heading they had taken. The heated debate involved harsh language and insults." The pilot is thought to have lost spatial orientation and control of the situation. The Russian Defense Ministry has made public the results of an inquiry into the mysterious fatal accident involving its Tupolev Tu-154 jet airliner near Sochi in late 2016. The flight bound to Syria crashed shortly after takeoff from Sochi Adler airport. All 92 on board were killed, including members of the Alexandrov Ensemble, the official choir of the Russian Armed Forces. The artists were to perform in Aleppo, which had just been liberated. The ministry's board of inquiry concluded (in Russian) that the aircraft crashed because of the captain's "erroneous inputs." The investigators have replicated the sequence of events down to each second of the tragedy. The Tu-154 departed from Moscow in the early hours of Dec. 25 for Sochi (1,620 km to the south of Moscow) for a fuel before continuing its journey to Syria. While the first leg played out without any problems, the second stage went wrong from the start. Investigators say the captain had "difficulty establishing the aircraft's position" while still taxiing for takeoff. He could not understand which taxiway to use to get to the advised location on the runway, and was feeling nervous about it." Seven seconds after takeoff a row ensued in the cockpit: The captain started arguing with his crew as to which heading they had taken. The heated debate involved harsh language and insults. Investigators believe it was then that the captain lost control over the controls and distracted his crew from reading the flight parameters. Then, as the aircraft was gaining altitude, the captain pushed the steering column, bringing the airplane's nose down and so slowing down the climb. After 53 seconds in the air, he called for the flaps to be retracted while still 157 meters above ground (the minimum flaps retraction altitude for this aircraft type is 500 meters). All this happened while the captain's steering column was kept in the nose-down position. This resulted in the aircraft nose-diving from an altitude of 231 meters. The subsequent actions of the captain, who appeared to have totally lost control over the situation and spatial orientation, led to the airplane starting to lose altitude at three times the normal descent rate. The investigators believe the flight was doomed from the 70th second on: It was banking 50 degrees and plummeting to the ground at an airspeed of 540 km/h. The inquiry concluded that the critical situation had been caused by the captain's emotional and physical exhaustion, and also because he lacked experience operating in complicated scenarios. For this reason, the investigators place part of the blame for the crash on the command of the 800th Air Base, to which the Tu-154 reported. The inquiry believes the air base command breached over 20 directives in assigning the captain with poor CRM (crew resource management) skills to the fateful flights. This conclusion overturns a number of initial theories, including a technical malfunction and an excessive payload on board. "The overload theory was abandoned several months ago, after specialists had found that the aircraft was carrying only 150 kg of freight (in addition to the passengers and crew)," Pavel Bulat, head of the International Laboratory of New Materials and Nanofilms for Microsensors, Microwave, and Power Electronics Component Base at ITMO University (Saint-Petersburg National Research University of Information Technologies, Mechanics and Optics), told RBTH. 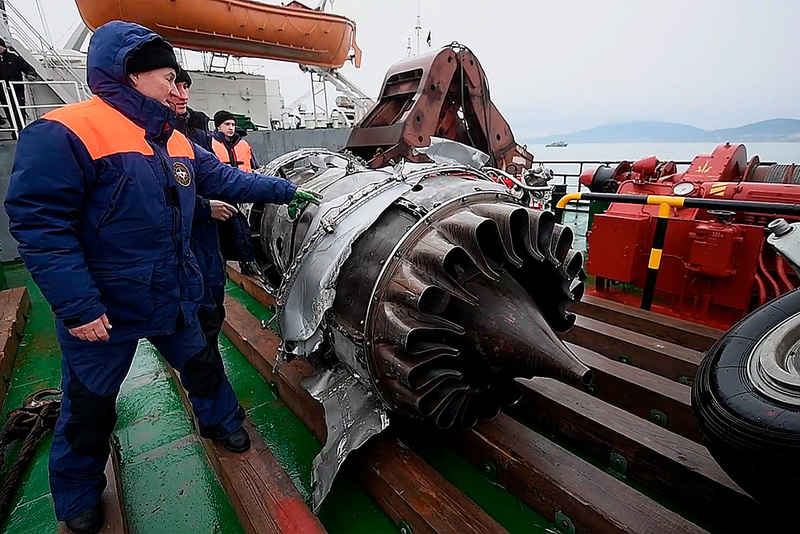 "Such a load simply cannot disrupt a Tu-154's center-of-gravity stability in any serious way. The inquiry merely confirmed the theory that the pilot lost spatial orientation." The expert believes that command of the 800th Air Base is in fact partially responsible for what happened: "They approved the flight documentation, and so on. The problem is, the crew were still exhausted from the previous flight, and why they had to be sent on a night mission is anybody's guess."